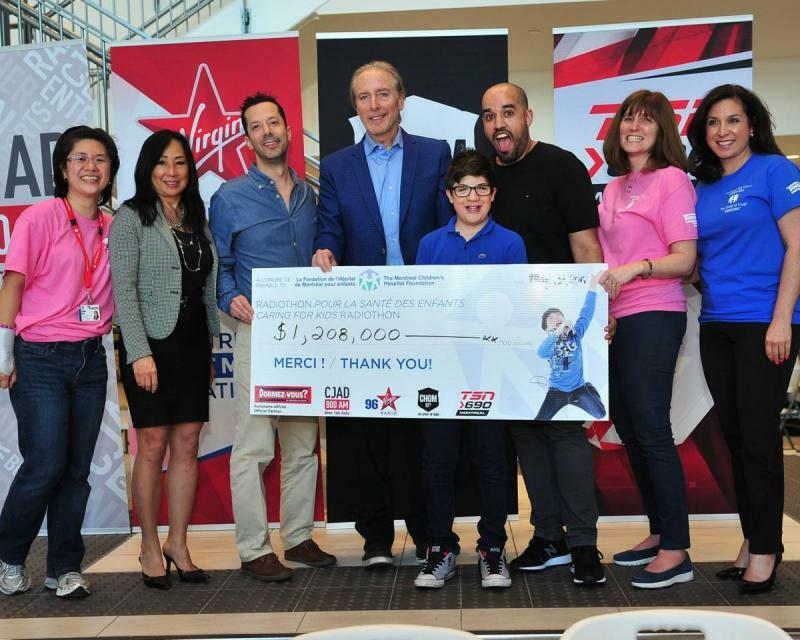 Thursday, June 1, 2017 – The Montreal Children’s Hospital Foundation and radio stations CJAD 800, 96 Virgin Radio, CHOM 97 7 and TSN Radio 690, are proud to announce that the 2017 edition of the Caring for Kids Radiothon, aired on May 31, raised ­­­­­­$1,208,000 for the Montreal Children’s Hospital’s young patients. Live from the Children’s P.K. Subban four-story Atrium, twenty-one patients and their families courageously shared how the hospital’s professionals saved their children’s lives. Over a dozen hospital professionals also joined CJAD’s Eramelinda Boquer live, between the hours of 9 a.m. and 3 p.m. Responding to the call of their favourite hosts, thousands of listeners joined the Circle of Hugs with a monthly donation of $20 or more. The final result clearly demonstrates their generosity. In 14 years, more than $22 million have been raised for the Children’s thanks to CJAD 800, 96 Virgin Radio, CHOM 97 7 and TSN Radio 690. All funds raised go to the Healthy Kids Fund to meet the most urgent needs of the hospital, which include medical and surgical equipment and funding for innovative projects. The Montreal Children’s Hospital Foundation thanks Bell Media radio stations CJAD 800, 96 Virgin Radio, CHOM 97 7 and TSN Radio 690, as well as our Official Partner Dormez-vous? and Miracle Hour sponsors Air Canada Foundation, A Bunch of Moms, Larente Baksh TD Group, Oceanwide, Revolution Textiles, Shire and Tenaquip. Thank you also to the dozens of volunteers who answered phones helping to ensure the event’s success. The Montreal Children's Hospital is the pediatric teaching hospital of the McGill University Faculty of Medicine. The Children's is a leader in providing a broad spectrum of highly specialized care to newborns, children, and adolescents from all across Quebec. Since its inception in 1973, the Montreal Children's Hospital Foundation has raised more than $320 million from the community to ensure that the Children’s remains on the cutting edge of teaching, research and care. The Foundation’s Best Care for Children campaign raised $105 million to help build the new Montreal Children’s Hospital on the Glen site. For more information, please visit childrenfoundation.com.For more information, please visit childrenfoundation.com .